Dark brown over yellow with a border geometric pattern. 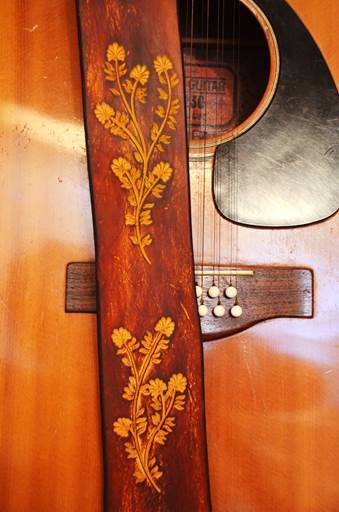 Looks great with a spruce top. Classic brown over gold floral makes you an instant icon. Really pretty. Don’t forget, custom orders are available in any combination of colors and patterns you can dream up. Click on the image to enlarge the picture. 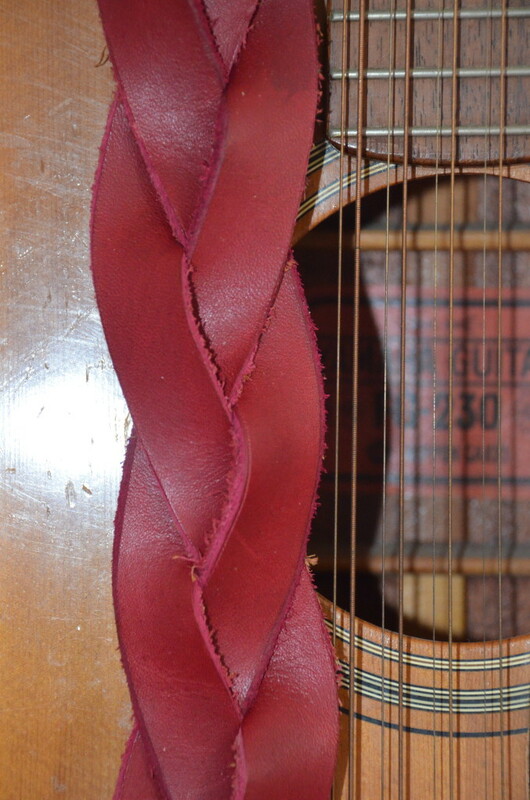 Supple latigo leather really lends itself to mystery braiding (What?! No open ends?!). Pretty burgundy overcoat. Fully adjustable. We can mix patterns and colors in virtually any combination. Just ask. Imagine a stained glass window around your neck. Hand scored and painted on nice oak leather…heavy enough too last, but still supple. Just rides better on your shoulder with every gig. Graduated earth tones will go with any axe. Really unique. Can’t find the perfect strap? Tell us what’s in your brain, and we’ll make it happen. 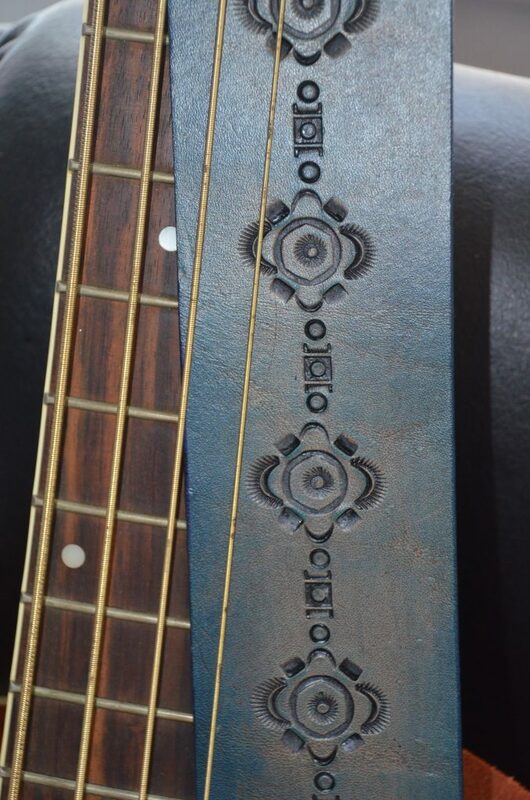 Tasty blue and grey color mix on this luxury guitar strap. Strong, supple and fully adjustable. Named? “Greystoke”. 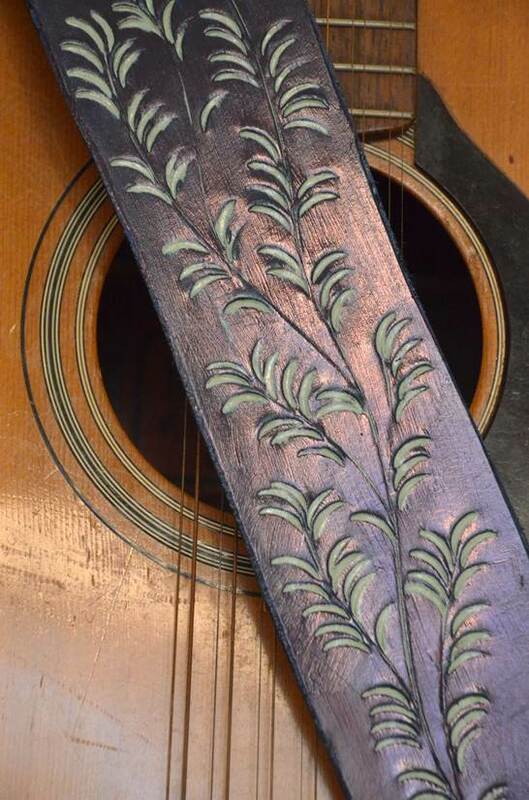 Black antique on this guitar strap is coated with a light blue topcoat. Guaranteed to make your axe look more expensive, and you more intelligent. Oak leather will last forever, and molds to your shoulder like your favorite glove. 2 1/2″ wide and fully adjustable for length. Not exactly your favorite color combination? No problem. We can combine designs and hues in virtually any color combination. Normally no mark up for custom orders unless you want to display your family tree. So much beautiful grain in this supple leather. Just brushed a light coat of brown over the top to highlight the cow wrinkles. Stunning. Simply “Supplerb”. No tooling necessary. 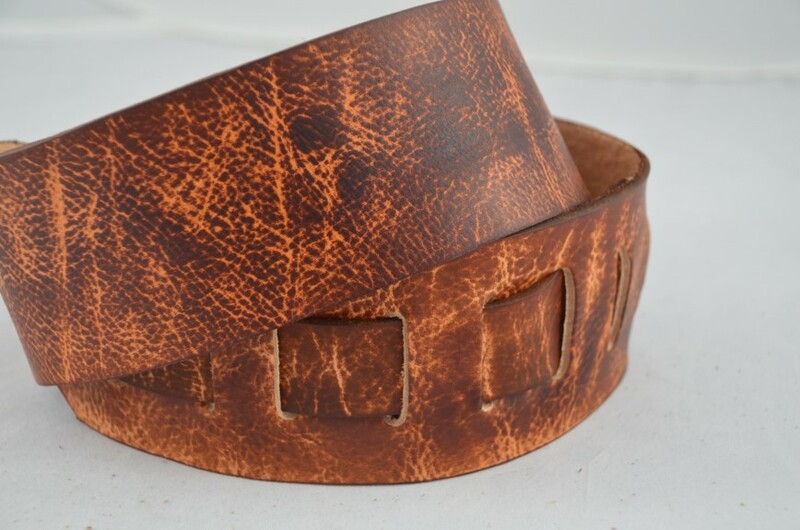 The grain in this leather speaks for itself…loudly. Brown overdye to bring out the highlights. Very soft, and very comfortable. Strum yourself to sleep. 2 ½” wide. No limitation as to width, designs or color combinations. 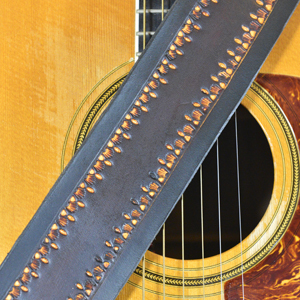 Standard strap adjusts from 37” to 54”, but shorter or longer straps are available at no extra charge. Special orders are our stock in trade, so if you see a pattern you like but want a different color, just ask. Normally, no mark up for custom work unless you require something really byzantine. Nice brown over tan center design. 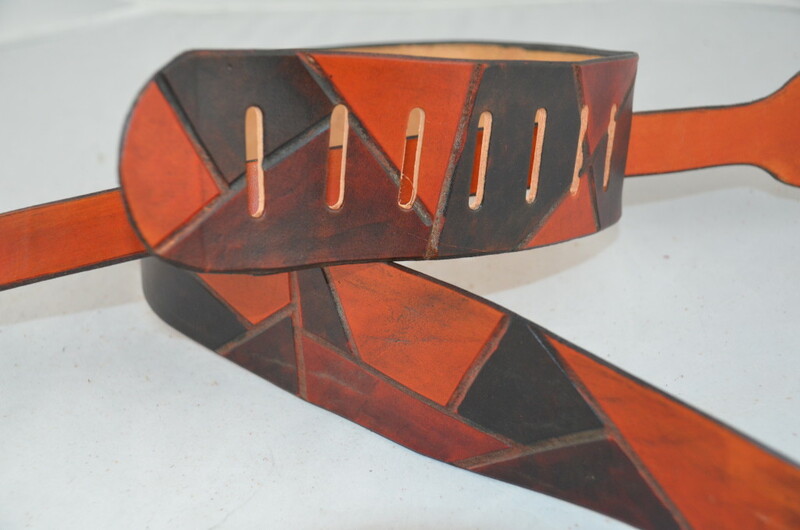 Very versatile strap that goes well with finishes from blond all the way to darker tones. Fern out! Lush navy over green – perfect for Earth Day gigs. Pretty oak leather. Don’t forget, custom orders are available in any combination of colors and patterns you can dream up. Click on the image to enlarge the picture. 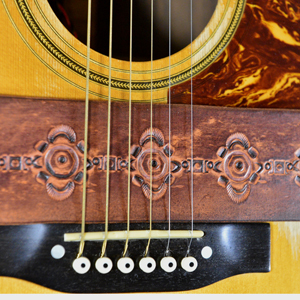 Lovely light brown antique highlights the broad band of center tooling on this baby. Superb oak leather for max comfort and durability. Fully adjustable. We can mix patterns and colors in virtually any combination. Just ask. 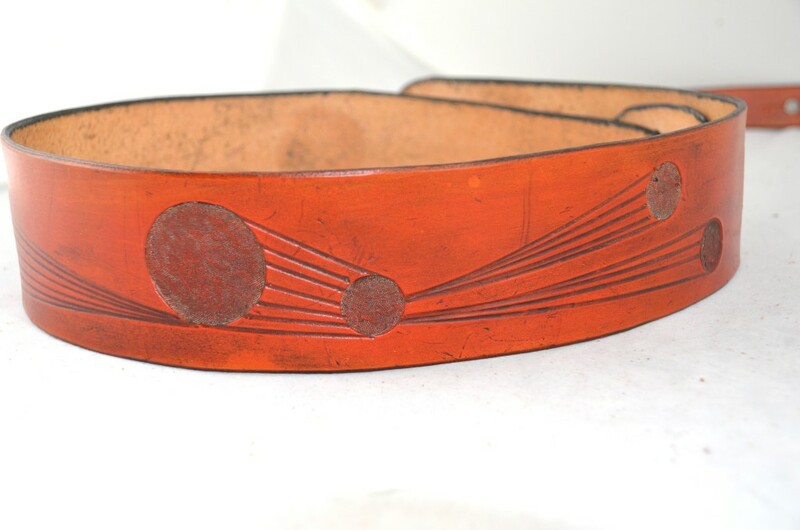 Random geometry on this free form strap. 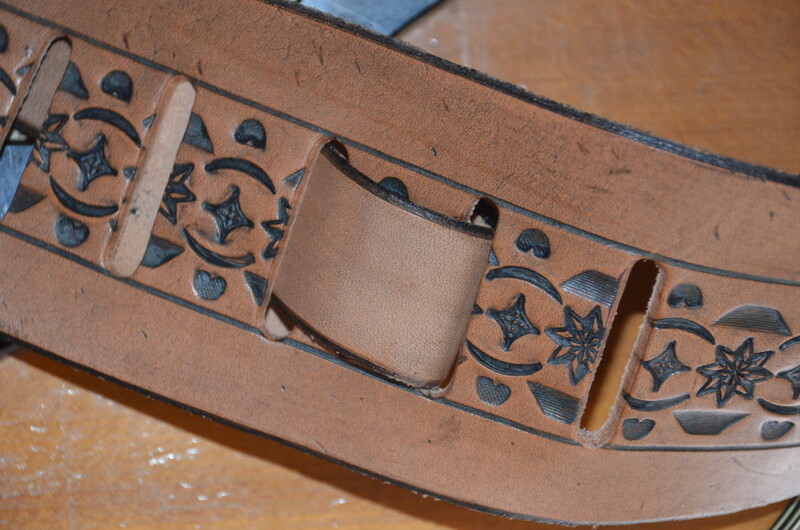 Saddle tan antique highlights the hand tooled pattern. Flexible oak leather will last for decades. Fully adjustable, and protected with waterproofer and surface coat. Definitely one of a kind. Remember, any combination of color, design, pattern, graphics is doable, so tell us your vision.